Here is a warning. 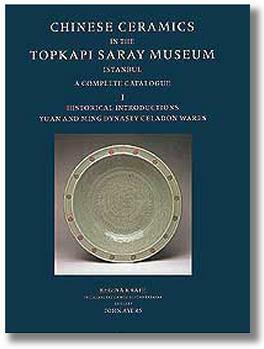 There is also a 3 volume set of the Topkapi museum from the writer T. Misuqi, and is from 1981, from Hong Kong press. That set of Hong Kong press is not the right one and has a lot less pictures in them. I wish I had not bought that set but instead the Sotheby’s set from Ayers and Krahl. Owning these three volumes enabled me accurately to identify, at a major UK public auction, a superb pair of 18th century chargers made for the Muslim market. These were catalgued as “late 19th – early 20th century”. This purchase alone repaid the original purchase price of the books (£450 in May 1986). Had the auctioneer had access to this book the chargers would have been in a premium Chinese ceramics sale at 50 times the selling price. The work is particularly useful for deciphering and dating early hall marks. “Fine Vessel for Wealth and Honour” springs to mind as the otherwise meaningless mark on a pair of 16th vases in our collection. A gold-mine of information for any collector. Even at today’s prices (Nov 2012 – around £7,000), these volumes are an outright bargain.